The financial crisis has severely dented the balance sheets of many States. Significant resources have been invested to buttress or nationalise ailing financial institutions, while GDPs have markedly contracted reducing tax income. Regardless of whether States have elected to implement supply-side or demand-side economic interventions in their attempts to exit this economic crisis, national tax authorities have redoubled their efforts to maximise taxation income flows by aggressively pursuing cases of evasion and avoidance. Corporate tax avoidance, in particular, is attracting increasing attention. In the recent past, several world leaders have decried corporate tax avoidance, the OECD has unveiled plans aimed at ending the “golden era” of this phenomenon, and the EU Commission has announced that it intends to investigate tax discounts and sweeteners offered by Member State to multinationals. Corporate tax avoidance is hardly novel; nevertheless, over the past decade it has acquired novel connotations. IP-rich multinationals, in particular, have erected complex networks of subsidiaries the sole purpose of which is to minimise, if not completely extinguish, their tax liabilities. Though there are multiple variants, one of the schemes most widely adopted by companies to reduce tax liabilities is commonly referred to as the “Double Irish”. Company A transfers its global IP portfolio to Subsidiary B. 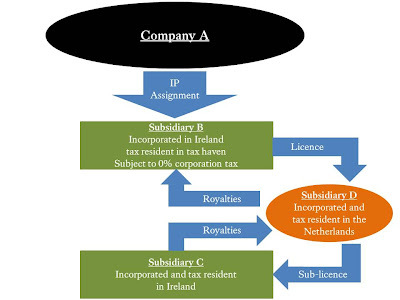 B is incorporated in Ireland, but is controlled and managed by directors based in a low corporate tax jurisdiction such as Bermuda, the Cayman Islands or Andorra; crucially, under Irish law, this characteristic renders B tax resident in these havens and therefore subject to their relevant tax legislation. Subsequently, B grants licences to exploit the IP portfolio to Subsidiary C which is incorporated and tax resident in Ireland; it is this link between two Irish subsidiaries which yielded the name “Double Irish”. C is the actual operative unit of the Company A: it owns real estate, it employs workers, it exploits the IP portfolio, it sells advertising and collects payments, ultimately generating earnings. Nevertheless, C does not make profits, as it has to pay royalties to B for the IP licences; crucially, B pays very little corporate taxes because it is based in a tax haven. Thus this structure allows A to shift all profits emerging from its IP portfolio to a jurisdiction where they will not be subject to a significant rate of taxation. In the Double Irish structure, however, C owes withholding taxes to Irish authorities for the royalty payments in favour of B. This liability can be avoided by adding a Dutch subsidiary in between the two Irish ones (this is commonly referred to as placing some Dutch cheese in between the Double Irish, forming a sandwich). Specifically, if B licences the IP portfolio to a Dutch Subsidiary D, which, in turn, sub-licences it to C, the withholding taxes owed by C disappear by virtue of Irish law tax exemptions regarding royalties payments towards entities based in the Netherlands. First, tax havens. Ultimately, all these structures rely on jurisdictions the law of which does not impose taxation on corporate profits and that concurrently provide a degree of anonymity. Famously, Ugland House in George Town, Cayman Islands, is the registered address for over 18,000 companies. Secondly, inadequate tax legislation. Numerous States have tax systems which are either not tailored to competitively and effectively deal with value generated by IP rights or suffer from exploitable loopholes that allow for the realisation of corporate structures the sole purpose of which is reducing tax liabilities. Thirdly, the intangible nature of IP rights. IP rights can be assigned, licenced and sub-licenced without impacting the business model, the provision of services or the flow of revenue streams. These transactions allow right-holders to move their IP assets under the legal regime of choice with immediacy and without incurring significant costs; similar operations are markedly more problematic when they involve tangible assets. It is very likely that all three of these elements will undergo changes in the coming years. Arguably, the first element is the least likely to be affected. Though several tax havens are coming under increased international pressure to normalise their legislation, it is unlikely that they will completely disappear in the near future. Moreover, over the past fifty years, there has been a steady and consistent succession of tax havens: when a State changes its legislation new ones are swift to fill the ensuing void, as the economic benefits are alluring. By contrast, there are already visible signs that tax regimes are being amended to better cope with IP assets. Several large States (including France, Spain, Belgium and the UK) have enacted or are in the process of introducing “invention boxes” or “patent boxes” systems. These “boxes” typically establish lower tax rates for income stemming from products or services built around a patent or another IP right (for the explanation of the UK system see here). Governments declare that these measures are aimed at promoting innovation and skilled labour, yet they also act as disincentives against transferring IP portfolios to other jurisdictions for tax purposes. Recently, however, more drastic proposals are being advanced. The OECD is championing a plan to encourage States to reform their systems so that tax is due where the economic activity takes place. Notably, this would render void any type of tax structure based on assigning and licencing IP assets; however, such reform would be drastic and is unlikely to be imminent. Finally, the intangible nature of IP rights cannot be changed, yet the legal regime governing the assignment, licencing and sub-licencing of these goods is coming under increased scrutiny. Throughout history, sovereign entities have often enacted legislation that limited the right to dispose of land or other strategic assets such as ships and natural resources; this was for both security reasons and wealth preservation. States have already shown that they are willing to block transactions that would result in IP transfers which are perceived as creating a security threat; more recently, tax authorities have started to investigate assignments and licences of IP rights which they suspect may impact the tax liabilities of the relevant parties. As IP rights become ever more cardinal to the security and prosperity of States, legislators appear to be inclined to compress the right to dispose of these assets. The extent to which this happens will be of vital concern to the world’s intellectual asset-driven economies. It should be noted that this structure is only used by US-headquartered groups as it relies on specific quirks of US tax law that don't exist anywhere else – effectively it's enabled by those quirks more than anything else. Arguably, it's encouraged by US tax law – I first came across the structure a decade ago, and it's certainly not been kept secret from the US authorities. I'd question the suggestion that IP rights-holders can move their IP assets without incurring significant costs – unless you move the IP at an early stage before commercialisation when it has very little value, most countries will impose quite significant tax costs in the form of exit taxes. Additionally, the Netherlands-element is no longer required in the structure as the Irish have changed their withholding tax laws.